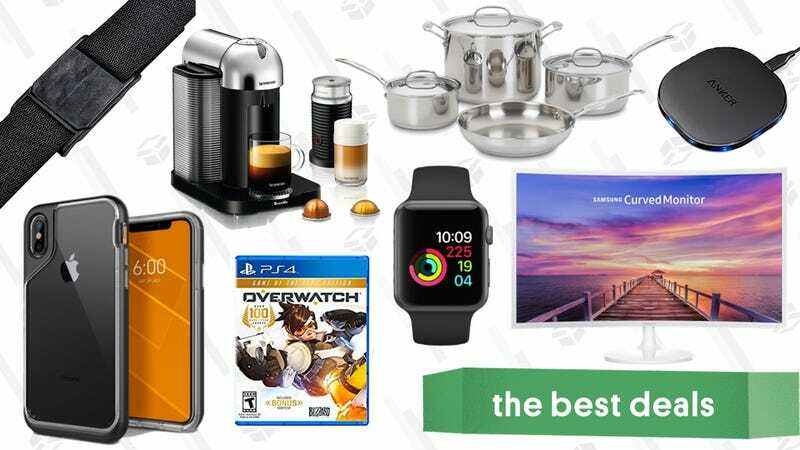 Fill your cart with deals on Samsung monitors, an Apple watch, magnetic belts, and a whole bunch more. If your workstation is due for an upgrade, Woot’s blowing out a whole bunch of refurbished Samsung displays today, with prices starting at just $110. If you’ve got the cash for it, my pick is this 32" QLED model, which uses quantum dots to achieve black levels that rival OLED screens. It goes for over $600 new, but today’s deal brings that down to $400. They aren’t Egyptian cotton or microfiber, but these Nautica sheets will look good on any bed. Pick up a set for under $50 during Amazon’s one-day sale and add a little nautical theme to your bedroom. Or be boring and go for the stripes. I don’t care, I’m not your mom. I will tell you to make your bed though. Prices vary by flavor, but you can get 12 bottles of Vanilla for $26 with this deal, or a 2.3 pound tub of powdered Soylent for the same price. Hands down, Nespresso is the easiest way to make decent espresso at home, and their high-end VertuoLine model will make regular coffee too. The whole set is down to $120 refurbished on Amazon today, complete with the latest Aeroccino milk frother. That’s over $60 less than buying it new, and a great potential Father’s Day gift idea. Update: This deal is back, and now just $64. These pieces feature aluminum cores in the bases encapsulated in durable stainless steel for quick, even heating, and boast a solid 4.2 stars with over 600 reviews. The set normally goes for around $80, so today’s $64 price tag (after you clip the $2 coupon) is a good chunk off. Today I learned that Fruit Leather is an actual brand name, and not just a generic slang term for those thin, stretchy fruit snacks. Adult Fruit Roll-Ups, if you will. Amazon will ship you a 48-count variety pack today for $9 when you use Subscribe & Save and clip the 20% coupon. If you’re in the market for a better toothbrush, but don’t necessarily need it to connect to Bluetooth or map your mouth, than this powerful Philips Sonicare Flexcare+ might be the one for you. It’s just $95 today after the $25 off coupon, down from its usual $130. It has five cleaning modes, including gum care and sensitive, and is believed to remove six times more plaque than a manual toothbrush. So go head on over to Amazon and get yourself one, your dentist will thank you. You can thumb through some new magazines at the beach or pool this summer with this Amazon one-day sale. They have around 30 print six-month-long subscriptions to pick from, to magazines like Wired, Vanity Fair, and Popular Science, starting at just $4. Or if you prefer the paper-free version, there some $5 digital options as well. This deal will only last through the end of the day, so grab what you need before it this disappears. Nenderoid’s Link figurines are always incredible, but in my opinion, the Breath of the Wild version has the best hair of the bunch . You can put your desktop Link into different poses and situations to match your current mood and work environment, like firing his bow (getting things done), playing with his Sheikah Slate (bored), or swinging his little club (someone’s microwaving fish in the office again?). Its two-tone design might not be for everyone, but $69 is a very nice price for a swiveling desk chair with height and recline control, plus flip-up arms. That’s down from its usual $90.